For a healthy heart, healthy joints and improved mental function. NutraSea is a pharmaceutical quality fish oil with a balanced EPA/DHA ratio making it an ideal supplement for optimal health and well-being. 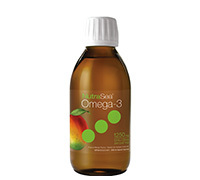 NutraSea with a delicious lemon flavour is suitable for children, adults and seniors. NutraSea exceeds the CRN* pharmaceutical quality & purity standards and is certified by PURE CHECK third-party verification. No. Plant based oils such as olive oil often use the term “cold pressed” however this is misleading. Cold pressed olive oils typically require a process temperature in the range of 30-50°C (86-122°F). In the case of fish oil pressing, the optimal temperatures range between 60-80°C (140-176°F). Using too low temperatures requires longer processing time and results in increased oxidation due to air exposure. During the subsequent distillation (purification) stage of the process, higher heat (200°C) is required. Although this step uses high heat, it is performed in the absence of air (vacuum) and light which prevents degradation of the oil. Regular quality checks throughout the process assures the oil is not been damaged. Directions: Adults and children 14 years and older take 1 tsp daily. Children under 14 years take ½ tsp daily.